How much Turkish Delight can one get in a scoop? 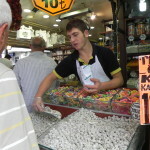 On my last day in Istanbul, I turned the corner from the Galanta Bridge and discovered the Egyptian Spice Market. 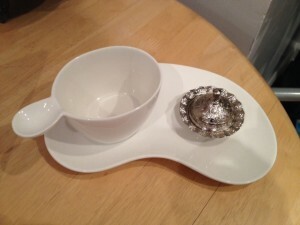 I needed to find these cool looking tea cups I saw at my hotel. They had wide grooves for your thumb to balance a hot cup of tea so that the hot liquid wouldn’t slip onto my lap. The restaurant staff said to go to the Egyptian Spice Market which has been around since 1664 – you can find anything you want. 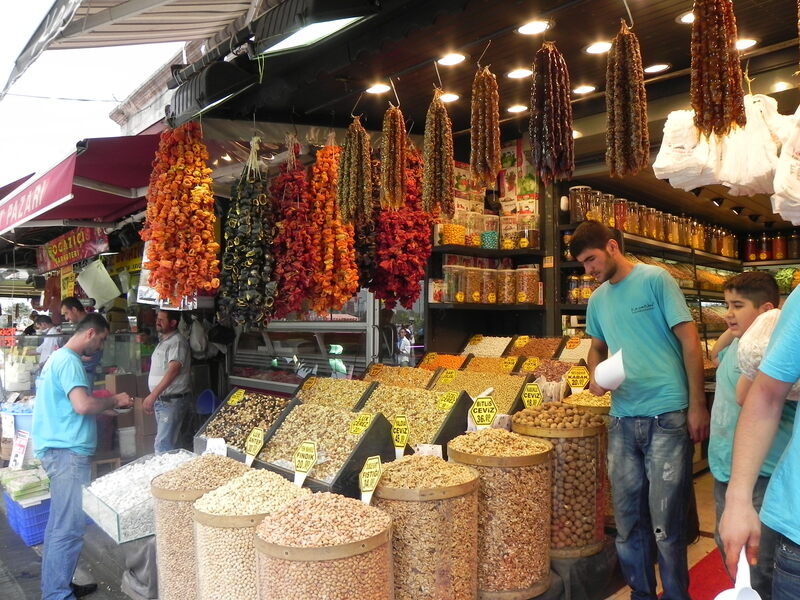 No kidding – this market was packed with everything under the sun for sale: nuts, cheese, Turkish coffee, olives, and of course spices. Every section of the place that took more than an hour to traverse through was a reminder of the unique aspects of Turkish food that made each one of our meals in Turkey so special. 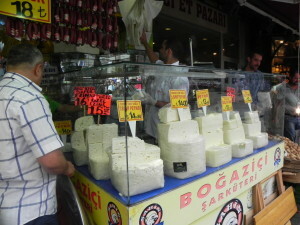 Our first stop was a shop that sold fresh slices of goat cheese cooling in a see-through case. Phenomenal chunks of cheese decorated our salads every day and I only wish I could’ve brought back buckets of cheese to the U.S.
And the olives! My husband and I gorged on them throughout our trip down the west coast of Turkey. They melted in our mouth. Every region had their own special olives and the owners proudly displayed them in jars with their signature labels on the front. 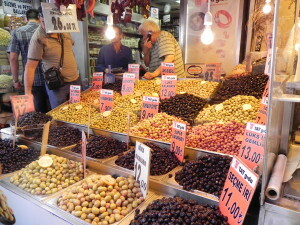 Prior to coming to Turkey, I always thought there were two kinds of olives: green or brown. I discovered so many different types of olives, each distinguishable by taste and texture. Now at this market, the colorful olives, glistening in olive oil, sat in buckets as the vendor stood over them bellowing out prices. When we turned the corner, I smelled morning coffee. Several stalls in a row sold fresh ground coffee and my husband fought to get in line for a bag. 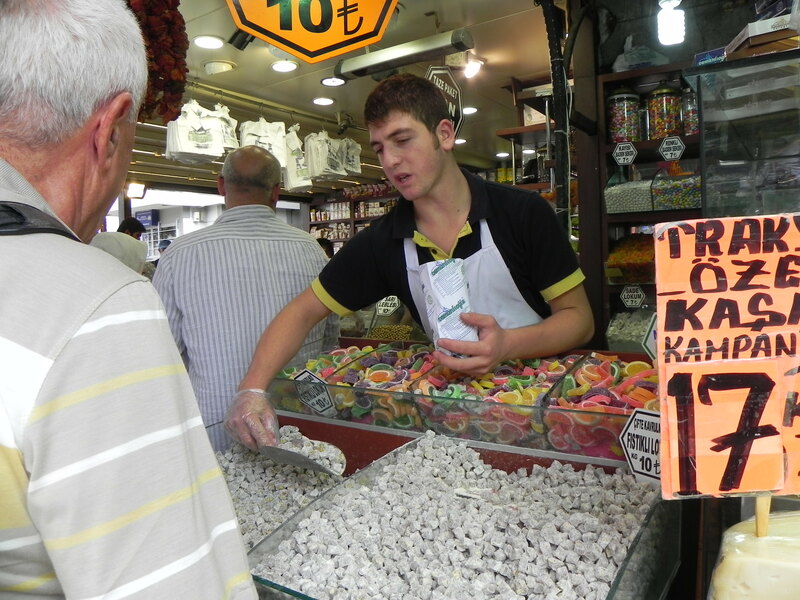 Then another row of stalls that sold nuts and more nuts. And what about the tea cups? The outer perimeter of stalls featured cups, saucers, tea pots and anything handy in the kitchen. “No, I don’t want to buy 100 of them,” I said as clerks pushed for me to purchase in bulk. I flashed a picture of my unique tea cups, but no one seemed to know. I almost gave up when I spotted the special thumb-grooved tea cups on a bottom shelf and while I was at it, I bought a beautiful tea pot to go with it. Arms loaded with our bounty from the market, we were now ready to go to the airport for the long trip home. I was sad to say good bye to my market that was a refreshing reminder of every special food I ate throughout my trip. Finally, I found my prized tea cup!